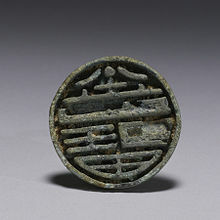 The Chinese emperors, their families and officials used large seals known as xǐ (玺; 璽), later renamed bǎo (宝; 寶; 'treasure'), which corresponds to the Great Seals of Western countries. These were usually made of jade (although hard wood or precious metal could also be used), and were originally square in shape. 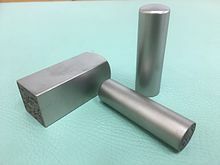 They were changed to a rectangular form during the Song dynasty, but reverted to square during the Qing dynasty. These seals typically bore the titles of the offices, rather than the names of the owners. 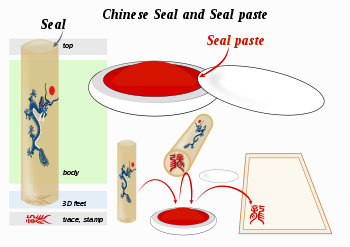 Different seals could be used for different purposes: for example, the Qianlong Emperor had a number of informal appreciation seals (simplified Chinese: 乾隆御览之宝; traditional Chinese: 乾隆御覽之寶; pinyin: Qiánlóng yùlǎn zhī bǎo; literally: 'Seal(s) for [use during] the Qiánlóng emperor's inspection') used on select paintings in his collection.